The Galápagos Islands are completely surrounded by Deep Ocean. Less than 20km (13 mi) off the coasts of the western islands, the ocean is over 300m (1000 ft) deep. Indeed, some of the oldest volcanoes are completely submerged, like the Carnegie Ridge, a submerged mountain range stretching east from the Galápagos half way to the mainland. 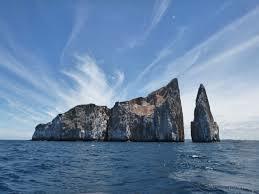 It includes the remnants of some previous volcanic islands that are possibly nine million years old. When an eruption occurs, the molten basalt disgorges in a lava flow rather than in an explosive blast that discharges cinder and ash to form a cone-shaped volcano.